Seagate sub LaCie has pre-announced a 6TB near line disk drive from its parent and it doesn't appear to use the slow write shingled magnetic recording technology. LaCie's news came out with the NAB event in Las Vegas, which opened on Friday. There are details of the drive on Seagate's website, although the drive has not been announced and is not yet available. a 25 per cent increase in areal density. Seagate says the drive has 8th generation technology, that's gen 8 PMR (perpendicular magnetic recording) technology. It claims its drive "provides a 25 per cent nearline performance boost over competitive offerings," with "best-in-class random and sequential read/write performance". The only competitive 6TB offering is Hitachi GST's 6TB He6 helium-filled spinner, which we believe rotates at 7,200rpm. We're told the 6TB Seagate drive, rated for 24 x 7 operation, "is built to support enterprise-class nearline workloads of up 550TB per year, which is up to 10× the rated workload of desktop HDDs," and "50 per cent more capacity over last generation," which maxed out at 4TB. A 25 per net increase in areal density over Seagate's 4-platter 4TB Surveillance hard drive would mean 1.25TB platters, and five of these would be needed to reach a 6TB capacity level. How many platters does the 6TB drive have? It has the same 26.1mm height as the 4TB Surveillance HDD, but that drive weighs 610g (PDF) whereas the 6TB Enterprise Capacity drive weighs 780g – we believe this points to an extra platter – making five in all. Get a datasheet here (PDF). A 50 per cent jump from 4TB to 6TB is a lovely increase in capacity. LaCie is offering a 2-drive, 12TB LaCie 2big with Thunderbolt 2 technology, hardware RAID, and speeds of up to 420MB/s. Oh yes please. I want one. And, dreaming on some more, 2.5-inch drives should surely be able to reach 3TB capacities with this technology. Come on Seagate, Tosh and WD/HGST, I want a 3TB MacBook or Windows notebook now. At once! This instant! Are you listening? What about storage array capacity? 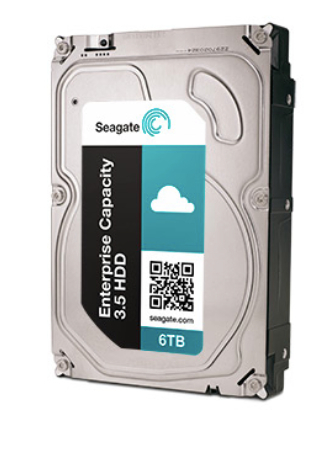 A rackful of 3.5-inch 4TB drives could get its capacity increased by 50 per cent. That's massive. Think about the 2.8PB BOSS rack we wrote about recently, the one Scality is using for its RING object storage using 4TB Kinetic drives. It could go up to 4.2PB capacity if Seagate bring out 6TB Kinetic drives - as it is surely bound to do. And if Seagate can bring out 6TB PMR drives without using helium-filled enclosures or shingling, then surely WD and Tosh can do so too. We can expect a wave of 6TB drive upgrades to work its way through the ranks of storage array suppliers in the next few months as WD and Tosh announce their 6TB spinners and OEM qualifications get under way. Downsides? RAID rebuilds will take even longer, giving faster-rebuild self-healing object storage technologies a fillip.